← Trying out Patisserie 27! 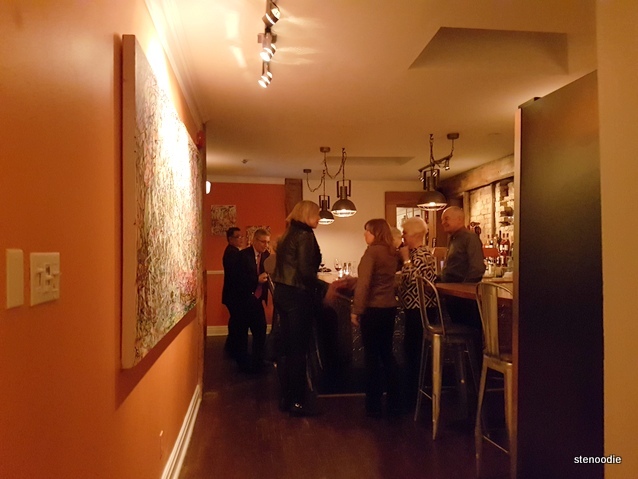 Maison Fou Brasserie is a new French restaurant in the Bloor West Village across from Runnymede Station in the west end of Toronto. They invited me to their grand opening open house reception this past Thursday where they served samples of their food and drinks. When we arrived at 7:10 p.m., we were ushered to the second floor after informing them that I was invited there for the open house reception. 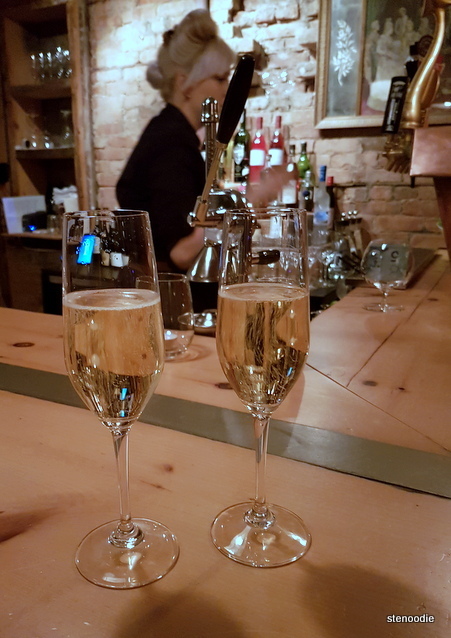 We received some sparkling wine in the dimly lit bar area and there were a handful of other guests mingling with the restaurant manager and staff. There was no word on what was going to happen at the opening reception from the staff upon arrival — no signs of food setups to photograph or appetizers being handed out so Priscilla and I took a seat at a table near the dining room area over the much-too-loud music that was playing and waited for the food to be served. Another blogger and her friend joined us at the table shortly as they were told to sit at a table in order for the food to be served. 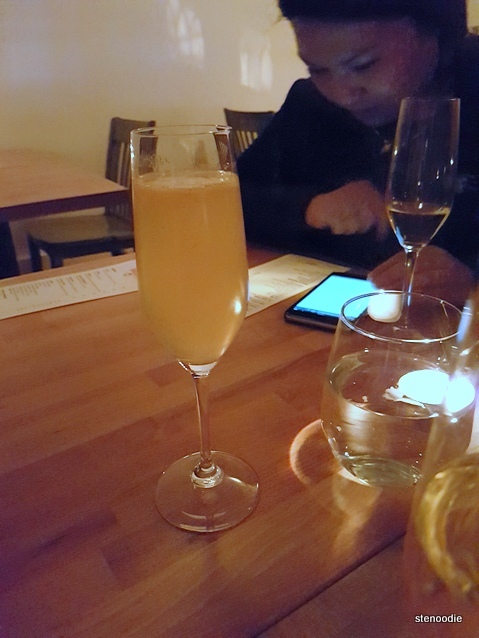 We sipped on our sparkling wine and were welcomed to order another drink from their drink menu from the staff catering to our table (on our own dime). We waited and waited as minutes passed by for the food to arrive. The server repeatedly informed us that it would be arriving shortly. We were then treated to the first food sample at 7:45 p.m, a full 45 minutes of waiting. Waiting for the food to arrive felt torturous… I apologize for my bluntness but why did it take 45 minutes for the first item, soup, to arrive? I appreciated that the server apologized to us for the wait, and even the social media manager came out to explain why the food was not out yet. He told us that there were a lot of unexpected walk-in customers that night and thus our dishes were in queue. The samples that we received were very small. 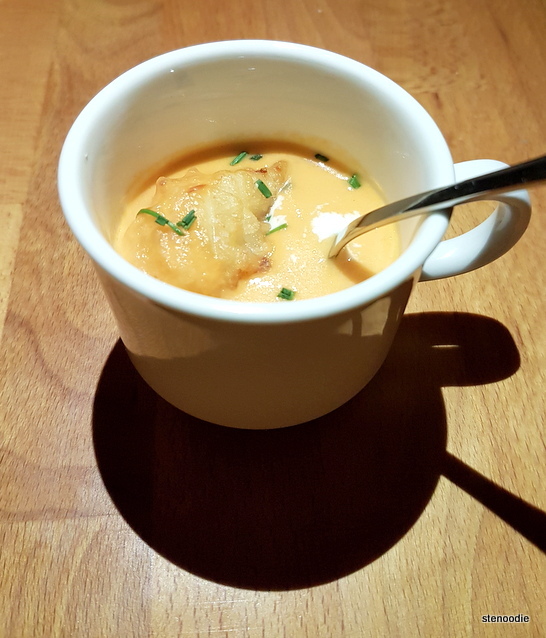 The first sample was a Crab Bisque with a crab beignet, house bacon, crème fraiche, chervil, and chives. The Crab Bisque smelled amazing and tasted pretty good. The crab beignet would have tasted better if it was more crispy. 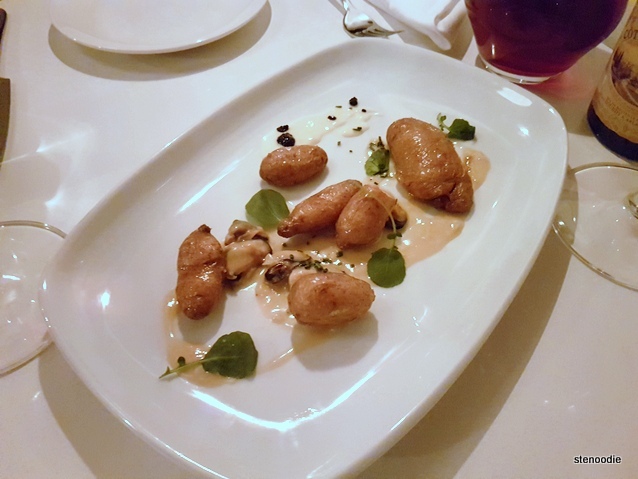 A sample of Parisian Gnocchi arrived next. On the menu, it says that this dish would include autumn squash, house bacon, wild mushrooms, shallots, sage, and garlic. The gnocchi was very soft and reminded us of ricotta cheese. I think most people are used to a firmer type of gnocchi. Also, it was lukewarm; something we all didn’t prefer when eating gnocchi. 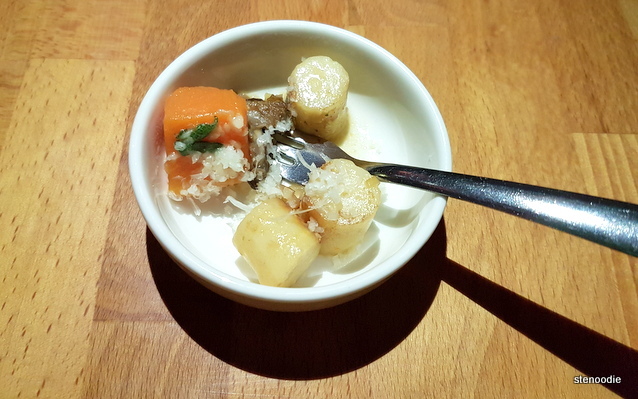 Next, we received an arrangement of small potatoes, mussels, and cream sauce on a plate. I found it a little odd that they put this platter on the table near the bar and asked us to walk over there to photograph it in the other room… if they wanted us to taste it (or maybe it wasn’t really made for us), why didn’t they just give us the platter to us at the table that we were sitting at? This dish was merely just that: potatoes, mussels, and cream sauce on a plate. Looking at the menu, this would probably be the “Potatoes Confit” dish with crispy potatoes, mussel cream sauce, gruyère, and caviar. After the photo, we received this on our table to eat. I can’t say that it was much of a dish because it tasted more like a side dish. After this, we received a sample of the Snails and Tails dish. 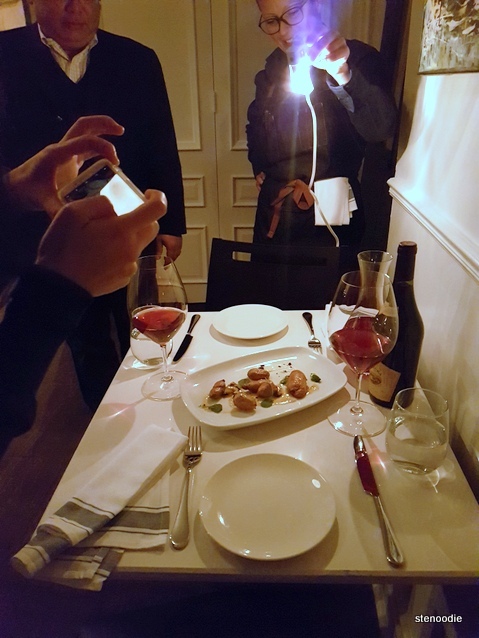 They would include brown butter garlic escargots, fried chicken tails, spicy harissa, and parsley cream on their regular menu. None of us enjoyed this sample. 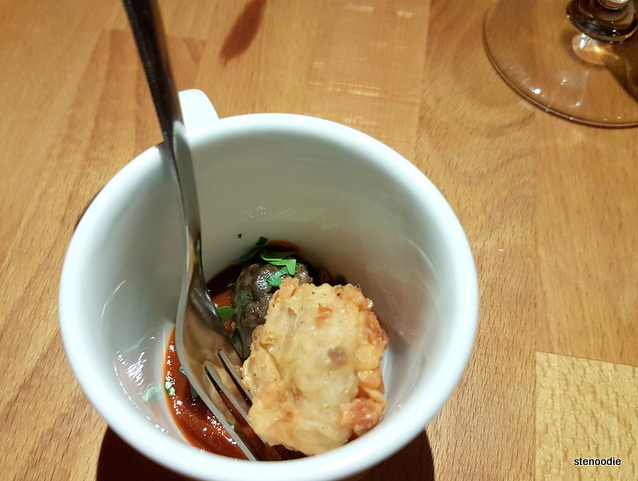 The fried chicken tail was just a fried puff of meat that wasn’t very memorable and the spicy harissa sauce did not go well with the escargot at all. 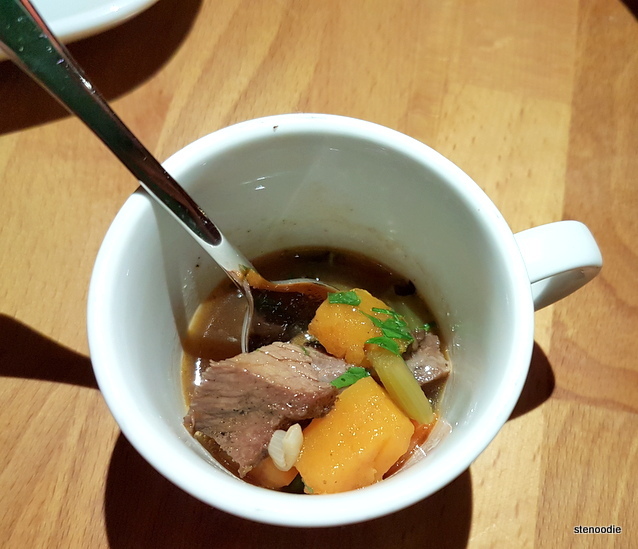 We received a sample of the Beef Cheek Pot-au-feu next. 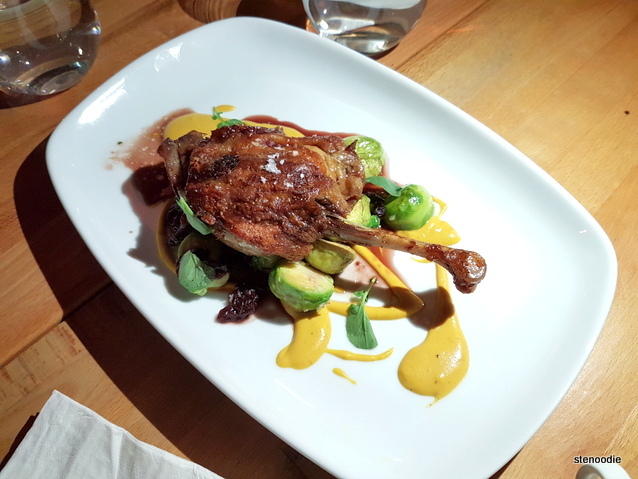 On their regular menu, this would include veal stock, autumn vegetables, fingerlings, and baguette. In our tiny sample that smelled amazing, the beef cheek was very tender but the amazing aroma that arose out of this soup did not translate to the actual taste at all. By this point, it was already 8:30 p.m. and we had only received a handful of samples of food that didn’t fill us up at all. It was getting late and Bloor West Village was a two-hour commute home for me and Priscilla. The server at this time had also cleared out all of our utensils, napkins, and serving plates from our table. We made the assumption that our “tasting” was over and that there would be nothing else to try. Also, the food samples had arrived at such a snail’s pace that we really didn’t want to stay any longer. Thus, we got up from the table, thanked the manager, and left the restaurant. I felt that if they did have more food for us, they could have said so when we said our good-byes. There was no “You are leaving already? But we have more food for you”, or “But you haven’t tried dessert yet!” (I assumed we would have dessert too.) We weren’t stopped from leaving the restaurant and there was also no word about inviting us to a proper blogger’s tasting again, which the social media guy did mention when he spoke to us earlier. The first impression of this restaurant was made. This was a poorly planned grand opening event where we didn’t have much food to really taste on. We tried six items in total, five of which were just nibbles of food. I would have appreciated a larger portion of food to try. Either they could have arranged it so that we received full dishes to share or to receive more of their menu items in smaller portions. I also have to wonder what was going on downstairs and if they had a different type of food sampling party there. Why was there a division of events anyway? Perhaps the first floor didn’t just cater to their walk-in paying customers but they had another type of grand opening event there (a more satisfying one). In any case, I will never know because we were ushered to the second floor for their “tasting” event. 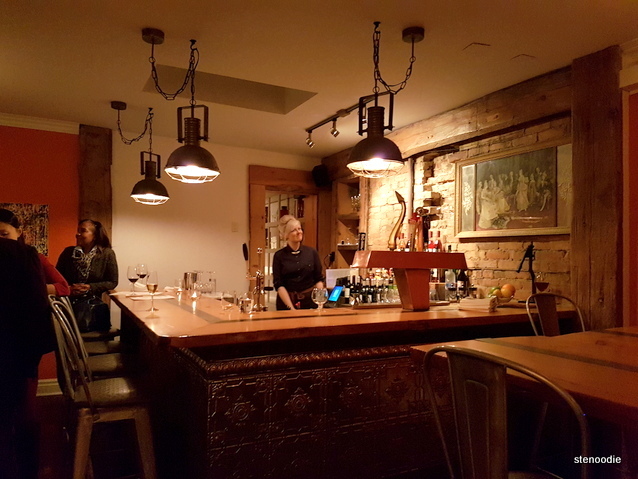 Despite my poor grand opening experience, I think Maison Fou Brasserie will do very well in the Bloor West Village neighbourhood — I will give them the benefit of the doubt. 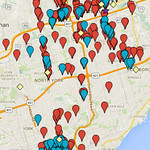 The foot traffic is large in this neighbourhood and their food and prices are acceptable. I wish them all the best! 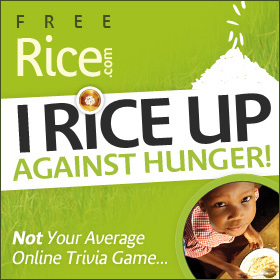 You can check out their dinner and brunch menus here. Thank you to the manager for inviting me to their restaurant for their grand opening event. 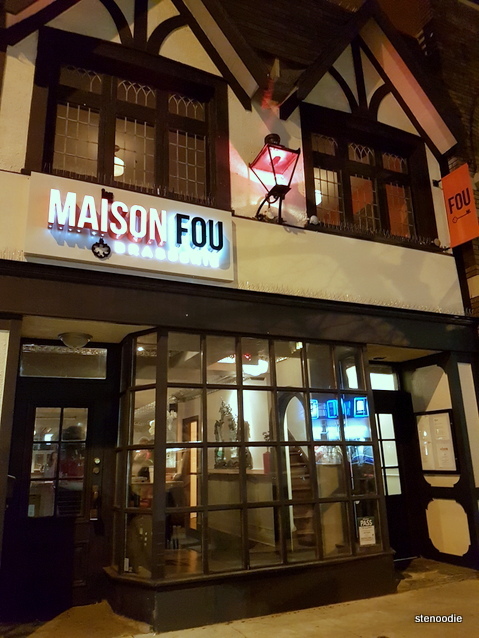 FTC Disclaimer: Although Maison Fou Brasserie reached out and invited me to a complimentary tasting, the opinions expressed here represent my own and not those of the restaurant. This entry was posted in Complimentary Adventures, Food and tagged 2197 Bloor St W, @maisonfouto twitter, Beef Cheek Pot-au-feu, Bloor West Village, Crab Bisque, Duck Confit, food blog, food blogger tastings, foodie, Fou 75, French, grand opening, Maison Fou Brasserie, Parisian Gnocchi, Potatoes Confit, restaurant review, Runnymede Subway Station, Snails and Tails, Toronto. Bookmark the permalink.